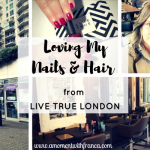 UPDATE – I have some FANTASTIC NEWS! 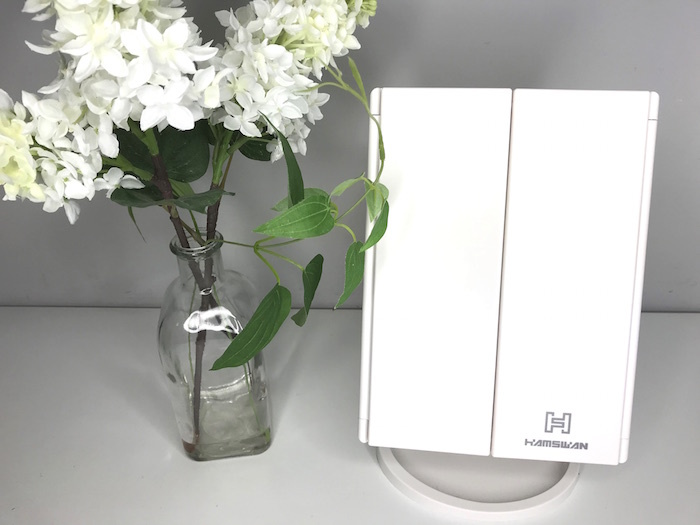 Hamswan has kindly given one Makeup Mirror as a GIVEAWAY to a lucky winner. 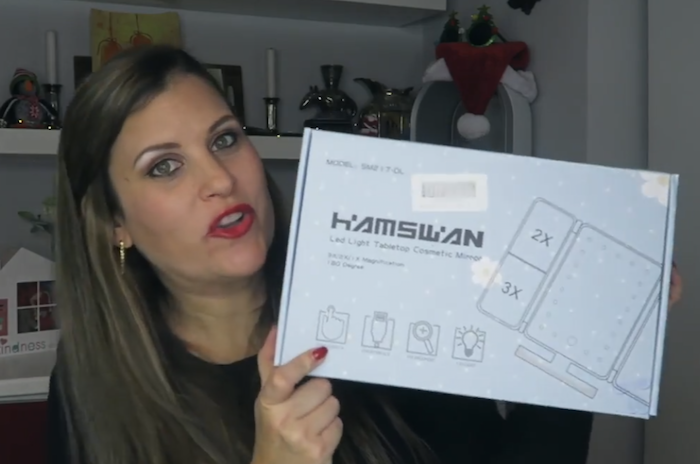 Full details of the Hamswan Makeup Mirror giveaway can be found at the bottom of this post. 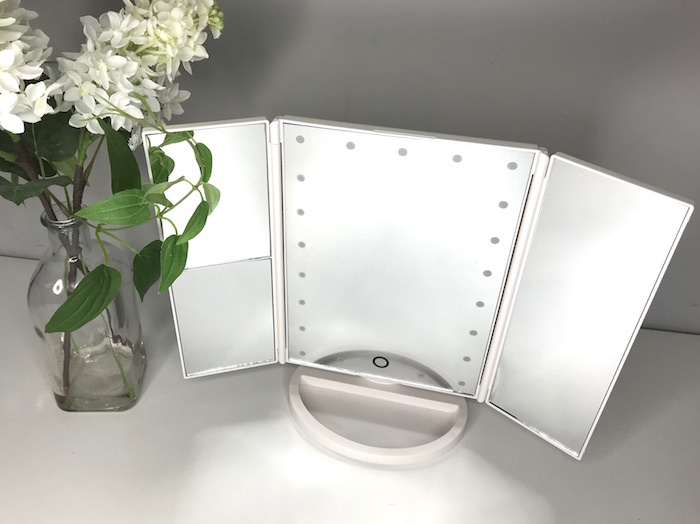 I have been searching for the best makeup mirror over the past few months, so I am so happy to tell you that my search has now ended and that I have finally found the mirror for me! You can’t imagine how excited I am! 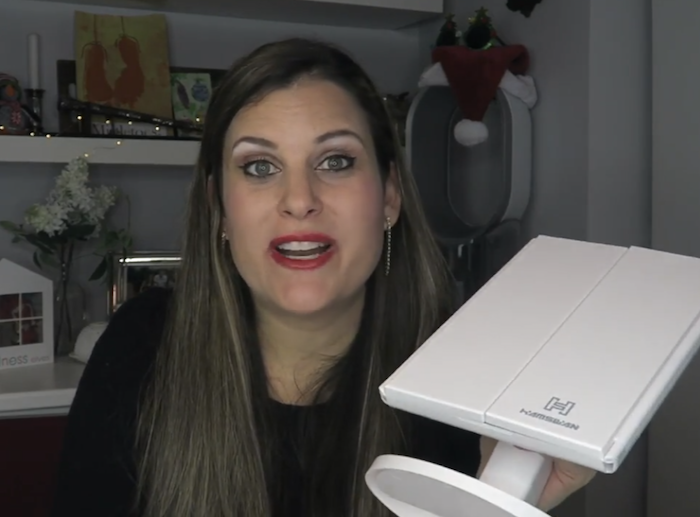 I was so happy to be contacted by Hamswan to review this amazing makeup mirror! When the mirror arrived, I opened it and tried it straight away. I had an event later that day so it was the perfect day to try out this mirror by using it when I put my makeup on. Premium eye-care LED light, gives out light evenly to ensure better eye protection. One of the things that I lack a lot in my house is light, especially in my bedroom. It can be quite dark so I have been constantly complaining about this issue and of course, it affects the way I apply my makeup because I cannot see very well. Having a mirror with a light was something I had in mind to get for a long time. The thing about this mirror is that it doesn’t only come with a light, it actually comes with 21 LED bulbs which you can light up or dim down depending on your needs in that particular moment. The light it produces is not too bright which is great for when you are applying your makeup. This for me is one of the best features. The lights are adjustable and are activated by a one-touch action. The power button is very soft to press. One long push adjusts different lightings to help you do your makeup in varying lighting areas. This is very useful. The lights are located on the main mirror in the centre and the lights have a dual power supply, so they can be powered by using 4 x AAA batteries or by a USB cable. This is great when you are on the go. USB travel chargers are popular nowadays so having the option to plug the USB cable into your travel charger wherever you are is a massive help! It comes in two parts: the stand (base) and the main mirror (top). You only need to click the mirror into the stand and that will put them together and it will be ready to use. This mirror adopts eco-friendly thickened ABS and glass materials to ensure it is safe, looks great and importantly, it is lightweight. It is so easy to carry around. It honestly doesn’t weight anything. 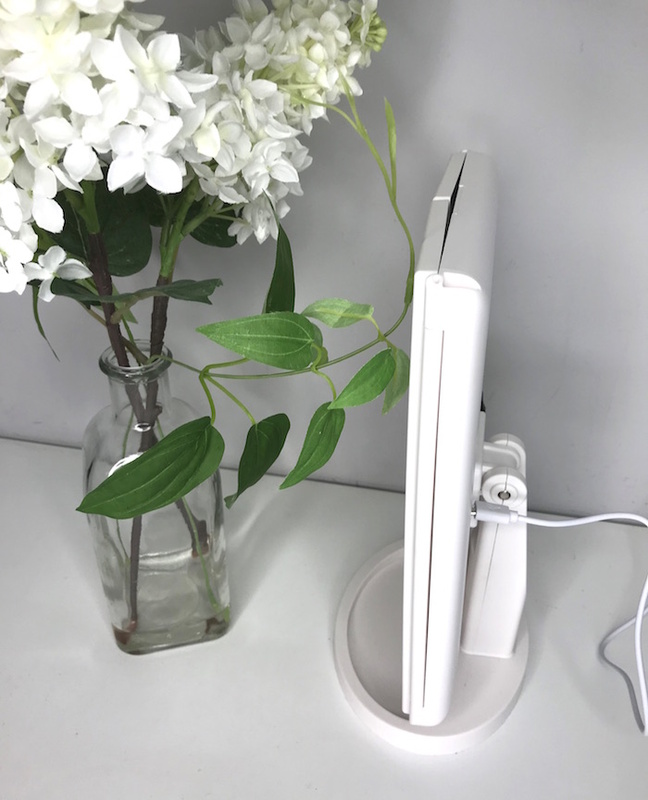 On the back of the mirror, you will find the on/off switch and the area to plug in your USB cable too. 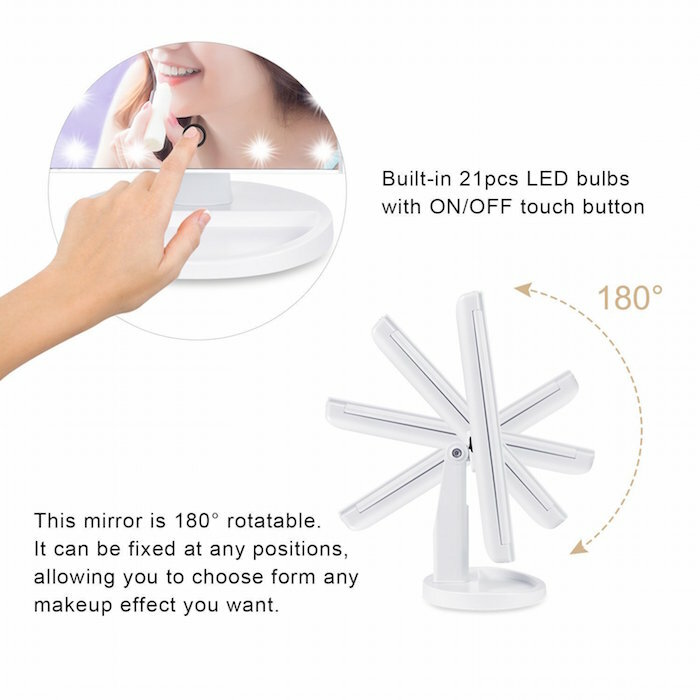 The mirror is fully rotatable, this means that it rotates 180 degrees and can be fixed at any position, so this makeup mirror gives you different view angles for the best makeup. The mirror has two side mirrors that swing out in a tri-fold function which makes it even bigger and better to see your full profile. When you open the mirror you will notice it has 4 mirrors in total. So you have the central mirror and two side mirrors. The central mirror and the right mirror have a regular mirror which is great for doing your makeup or your hair. The left side mirror is split into two sections which have a 2x and 3x magnification spot mirror. The one on the top left has 2 times magnification and the one on the bottom left has 3 times magnification which is great for applying a detailed eyeliner or when you are tweezing your eyebrows. It can also be great for putting on your lipstick, contact lenses, powder or even for men it could be great for shaving. So as you can see this mirror has all the features you need to make your make up spotless. 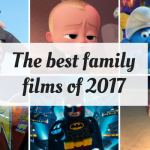 It could be a great gift for your loved one or for treating yourself! I have great news for you all. Hamswan has kindly given me a 5% discount code FRANCAD5 to use for all Hamswan products! This code is valid until July 2018! Fantastic, right? You can apply it when you do your checkout HERE. I really love this mirror. 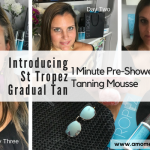 It has definitely changed the way I apply my makeup. It is great that it comes with LED lights and that some parts of the mirror have x2 and x3 magnification spots. This is perfect for me. It is great that you can turn on the lights with batteries or by using a travel charger which makes it helpful when travelling. This is particularly useful given how compact and foldable the mirror is. Overall, this mirror is perfect for me! It has all I need to apply my makeup. I am so happy and I highly recommend it! Now onto the giveaway. 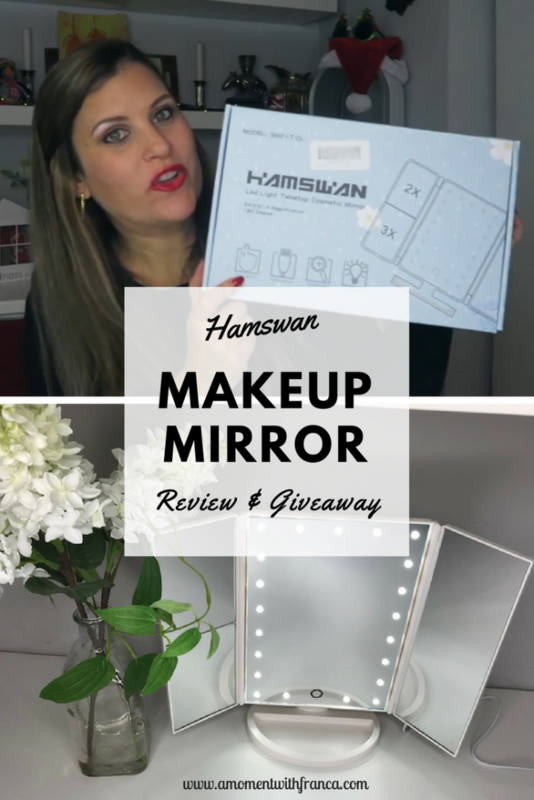 I am running a giveaway so that ONE of you can Win a Hamswan Makeup Mirror. 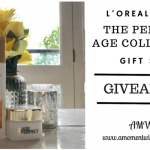 In order to have a chance of winning, you just need to enter the giveaway below. Good luck! This Giveaway starts on Tuesday 23rd January 2018 at midnight. 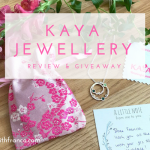 This Giveaway closes on Tuesday 13th February 2018 at midnight. 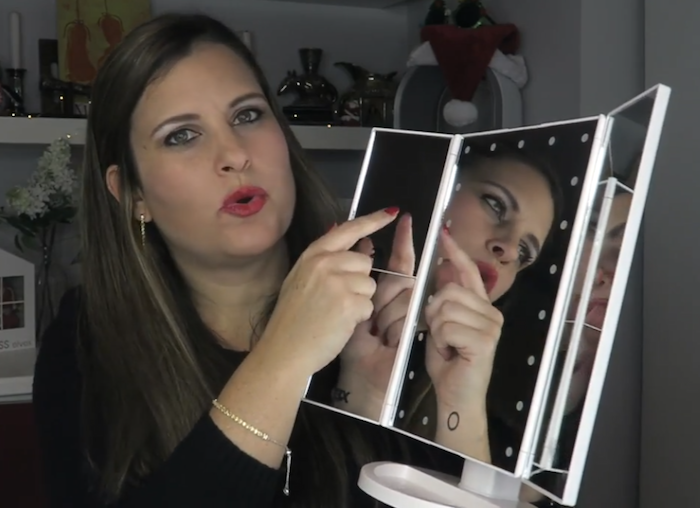 Do you have a makeup mirror? What do you think of this mirror? Do you like its features? Would you like to get one too? *Disclosure: This is a collaboration with Hamswan. However, all the thoughts and opinions are my own. It contains affiliate links. love this mirror, you can see the sides of your head when you are trying to create a look, great for work when you want to look polished and for a night out when you want to see your hair and make-up from different angles. Yes, I have a makeup mirror. My two girls would love this mirror for their room as it looks like a pop star’s mirror! 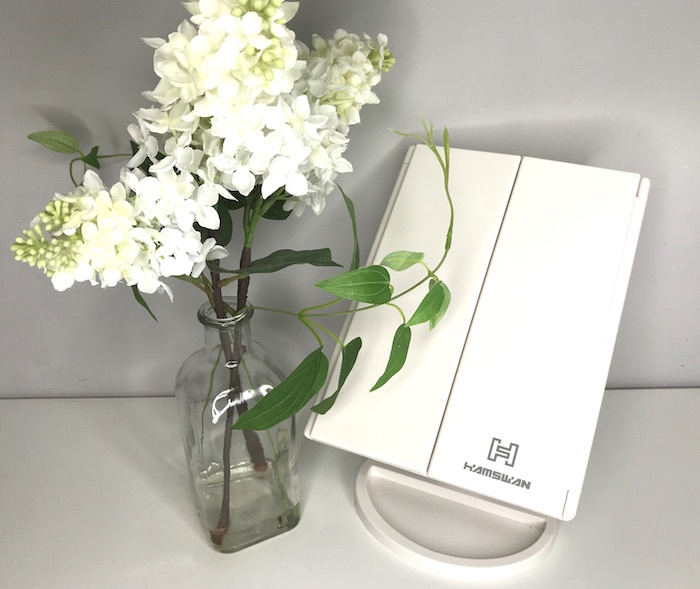 When you need a clearer and brighter view to do your make up and hair, the Hamswan Mirror is the perfect solution. I do have a makeup mirror and I think this mirror is great. I love its features. I’d like to get one too. I wear make up everyday and find it hard to sit at my desk as the light just doesnt reflect well. I love that this mirror can be used anywhere and great for travelling as it folds up. The lights are a bonus and i love that it rotates so you can have it at that awkward angle of applying mascara haha! I love that it can be folded away. It would stop m cat getting his grubby paws all over it! I only have a small make up mirror. I love this one with the lights around it, it’s fabulous. Yes i do have a mirror but its so dark and dingy, this is just the ticket….. I have one I inherited from my mum but it is smashed on one side so a new one would be brilliant! I don’t but this one looks great – would love this! I have a makeup mirror but it’s not as good as this one! Yes I have a makeup mirror but I’d love this one as it looks far better than mine. It has far more light and strength than mine. I love the fact that it lights up making it so much easier for the darker months.The mirror I currently use is the bathroom mirror which I unhook from the wall each morning and take to my bedroom,then put it back in the bathroom.This type of mirror would save a lot of time and be ideal.I’d definitely want to get this mirror it looks great. Looks like a fab mirror. I like the fact that it can tilt and the extra lighting is a great feature too. Would absolutely love this mirror, we’ve got 4 mirrors in the house, but the light is bad! you can’t get a true refelection to see what your putting on or doing your hair. I don’t have one. this mirror looks amazing. 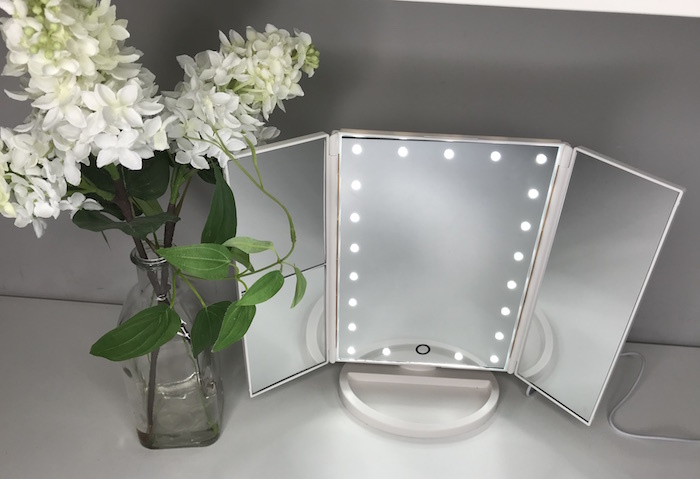 I do have a mirror but not has as nice as this one I love that it lights up and my makeup would be so much easier to apply using this as I’m a glasses wearer. its a mirror, but one out of our living room, but its a case of putting it in the right light in the bedroom so i can properly. This mirror looks fantastic though! I used to have a makeup mirror with lights, until I dropped it! Such a nightmare trying to do makeup in the winter when its dark, would love a new mirror like this! I don’t have a make up mirror but this mirror looks great which now makes me want my own make up mirror. I don’t have a make up mirror but find it quite difficult with the bedroom mirror to get the lighting right and to see properly when I take my glasses off! This mirror would be perfect! I do not have a make-up mirror. We have some mirror tiles in the en-suite (last owners choice) which are too high for me to see into without being on my tip-toes. Or I have a small mirror which I cannot see all my face in at once. Bit hit & miss really. I’d love to win for my wife, she needs one! Love this. What a fantastic prize ! I don’t have a make up mirror and it’s something I really need! I do have a make up mirror. The lighting would be useful on dull mornings. I don’t have a make up mirror but need one. The lighting in my bedroom isn’t very good and when I get to work in the cold light of day my makeup doesn’t look so good! I don’t have a makeup mirror, so I would love one of these as it sounds really good, thanks. I like the fact that this comes with LED lights. I have a mirror but it is nothing like this one and is a bit cumbersome too. I do but the lighting is do much better looking here. I’ll need to loo, into getting one! We don’t have a make up mirror but this would be ideal for shaving. I have a mirror but it has no lights this would be great for doing my make up! I always use a mirror. I love this mirror. The lights are great! no i do not have a makeup mirror, but i would love to have one! I don’t have a make up mirror but would love this fab one. Would be fantastic to hAve a make up miror. Never had onebefore! I dont have a make up mirror so this would be perfect for seeing clearly what I’mm doing. I had one so similar and a day after I bought it I dropped it, I was so sad!